Disclaimer: This blog post will probably be lengthy, however, I feel it’s time to share how I’ve seen God in my life. I wasn’t born into a wealthy family. My father only had an eighth grade education and my mother only went as far as to graduate high school. I was the oldest of three daughters and often had to help raise my younger sisters, while my mother worked two jobs and my father worked what jobs he could. My dad was also an active alcoholic during my childhood. He chose to get help when my mother kicked him out. Then he sobered up and stayed that way. However, my sisters and I spent many nights playing in the a church room, while my mom attended Al-Anon. We were pretty shielded about why she attended. I will say through all our hard times, my parents never accepted government assistance, although looking back, we more than qualified; at times. My mother was the foundation of our family. She made sure my sisters and I went to church on a regular basis. Back then, it was what was required. We didn’t always go willingly, but we went. We grew up in the United Methodist Church where we attended Sunday school, were confirmed in the faith, joined the youth groups and choir. It was the only church I ever knew and it was the church I set the standard for my future adventures in faith. Was I devout? Not, in the least. I believed in God, but rarely said grace before meals, prayed or reached out to anyone in my church. I was missing a connection. I married at just 18-years old. I had no support, but my family went through the motions of my marriage anyway. Needless to say, they were right, along with everyone else, and my marriage was doomed to fail. One thing I did take seriously, was my marriage vows; esp., ’til death do you part’. Little did I know, that vow almost cost me my life. That quick foreshadowing was meant to segway into how my (now) ex-husband was extremely abusive. There were two separate times he actually tried to kill me. In the six and a half years we were together, we had four children. I was a typical abused wife, caught up in the cycle of violence. I believed if I had dinner ready on time, I wouldn’t have gotten yelled at. If I wasn’t so tired, from being pregnant, the house would be cleaner and I wouldn’t have gotten hit. I believed him when he said he was sorry. “It won’t happen again.” If there were ever famous last words, those were it. We attempted counseling. It was couples counseling, in addition to individual sessions. When your therapist tells you privately, “have a bag packed and be ready to leave at a moment’s notice”. Go ahead; it’s ok to read into how serious the danger level was. Yet, I had two small children and I had no place to go. No one knew of the abuse; esp. not my family. My mom didn’t even find out until I was pregnant with my fourth child and we woke up to our house on fire. We ended up staying with my parents again; which my ex-husband made for a less than amicable time. I had been journaling about the abuse and hid the notebook under my mattress. When we moved out, I forgot about it. Months later, my mother found it, read it, and called me crying asking if I was being abused. I broke down and admitted everything. I had attempted leaving before, but my ex-husband convinced me to come back; esp. after he cleaned out our bank account and left me financially broke. I had little choice (or so I thought). I will spare the rest of the details I can remember. I used to cry myself to sleep asking God, “what did I do to deserve this”? The abuse only escalated. It got to the point, I ended up having to leave my children behind, in order to survive. My youngest son was only six months’ old. I left and ended up staying with a guy I barely knew. I had no job because my ex-husband told the restaurant I worked at that I abandoned my children and they felt the need to tell me to go home and be a better wife and mother. Wow! I was floored. I felt like enough of a failure without my boss and coworkers passing judgement on me. One day, when hopelessness was overwhelming, I made the decision to just end it all. I went and bought a bottle of sleeping pills. It was the easiest way; just go to sleep. Little did I know God had other plans for me. I carried out my plan. I didn’t leave a note. Got a large glass of water and began swallowing three pills, at a time, until the bottle was empty. I laid down on the floor, with a pillow and blanket, and planned to go to sleep forever. I fell asleep and then felt convulsions. It was like I was having a nightmare and I couldn’t wake up from it. I heard in my mind, “you’re not going to die today.” I continued to have convulsions, as if a doctor had paddles to my chest and was yelling, “CLEAR!” I have no idea how much time passed. It was dark outside, I woke up, still alone and thought, “I can’t even kill myself right”. However, after that ordeal, I did believe I wasn’t supposed to die that day and never attempted to take my life again. Long story short, I ended moving to California. The state I grew up in had horrible domestic violence laws. They didn’t have anti-stalking laws. I had no protection. Once my ex learned of my change in states, he chose to give the children to my mother and followed me. I lived several years looking over my shoulder. I even arranged for someone else to check my post office box, in case he would be waiting for me one day. Skip ahead years later, and I remarried. My children were still with my mother. I would call and speak to the kids, but they wanted me home and it wasn’t possible. Anger and resentment festered from them. I was losing my children and there was nothing I could do to stop it. I admit it. I was a bad mom. I wasn’t strong enough to stand up for myself and it cost me my children. I did have one more child. My second husband had no children and I had to prove to myself I wasn’t a horrible mother. With the abuse factor removed, I didn’t suffer the severe depression I had with my other children. I wasn’t hospitalized for postpartum depression, as I had been twice in the past. My mother and I chose not to tell the children about their half-sister. They resented me so much already. I knew them thinking I just left to start another family would be first on their mind. I knew this because that is what their father had told them. He eventually left California and returned to my home state to get custody of our children. Meanwhile, when my youngest was 5-months’ old, I started looking for a church to go back to. I was missing something. I was so alone. I found a United Methodist Church, close to home. I took my little one with me and walked into Wayside UMC for the first time. I figured, if it wasn’t for me, I could use the baby as the reason I had to leave. We stayed and I eventually became a member of the church. Even though the church reminded me of the church I grew up in, I still hadn’t made any close connections. I went through the motions, but it wasn’t 100% what I was looking for. In June 2007, my father, whom I’ve always had a strained relationship with, was diagnosed with Stage-4, stomach cancer. He was given three to six weeks to live. I called to speak with him while he was in the hospital. He had forgotten he had an older daughter; he thought I was my sister playing a joke on him. After five agonizing minutes, he finally remembered who I was. We spoke til he got tired. It was the last time I was speak with him. He died exactly three weeks from diagnosis. A few years later, I reconnected with my sister. A sister that I didn’t speak to for 10 years. Yet, after all the abuse and loss I had already experienced (which I glossed over quite a bit), my 37-year old sister was diagnosed with Stage-4 breast cancer. Diagnosis: less than a year. My mother and I prayed, but we were also facing reality that her breast cancer was aggressive and odds of recovery were slim to none. After her passing in June of 2012, I was lost. I had survivor’s guilt. I stopped going to church. No one called to check up on me. I didn’t feel missed or cared for. I flew home to bury my sister, flew back to California and had to pretend my life was fine. Let’s add insult to injury and have my youngest sister call me one morning while I was at work. Seems my mother was rushed to the hospital with food poisoning. After some testing, it was determined it wasn’t food poisoning. She had a bowel blockage and required emergency surgery. My mother never made it out of surgery as she died on the operating table because she didn’t have a small blockage; all of her intestines were dead. She couldn’t be saved. My mother passed away one year and 13 days after I buried my sister. To say I was angry with God was an understatement. Nothing made sense. I was being punished and I didn’t know how much more I could take. My older children, except for my first born, didn’t want anything to do with me. If I didn’t have my youngest at home, I don’t know what drastic steps I would have taken. I became guardian to my two youngest nieces. They were my sister’s children, whom my mother was raising. Life was turned around. There was a huge struggle to bring two children to California. Resources weren’t there, but I felt this is what I had to do. Raising two more children, trying to mourn my sister and mother and a family who had a huge adjustment factor, was more than I could handle. I am thankful for my friends on Facebook. Ironically, they became my only support system. Some were friends I knew personally; others were strangers. They were the only beacon of light, during those dark days. I would attend church sporadically. Everyone was nice, but no one really tried to know me other than the polite exchanges we had before service. There was still a disconnect. My nieces eventually returned to my home state; without my consent. That’s another story, for another time. With the way the events played out with my nieces, it ended my relationship with my youngest sister; my last relative in my nuclear family. I began to look for other churches to attend. I tried to stay within the United Methodist community. It was all I had ever known. I also tried some non-denominational churches and even went back to Wayside a few times. I joined another local church; but that lasted about a year. It wasn’t the right fit. Nothing was right. Nothing made sense. I gave up. A couple months ago, I began another search for a church to call home. I had exhausted all the options within the local United Methodist organization. I Googled some local churches and found one within a couple miles of my home. What caught my attention was they spoke of relationships and not religion. They also offered hot coffee. Ok, was it wrong, I was drawn in by coffee? I figured, I could use a free cup of coffee, listen to the message and just leave if it was like all the rest. I was pleasantly surprised. I’m used to a “welcoming” committee, but it seemed everyone who first saw me, made an effort to say hello. After the service, I several people came up to me and wanted to get to know me. It wasn’t what I expected. I returned week after week. I even joined a weekly Bible study group. While I don’t share much at church or within the study group, it’s been nothing but a positive experience. With this June being the fifth angelversary of my sister’s passing and the fourth angelversary of mother’s passing, I don’t feel as alone this year as I have in previous years. I can attribute that to attending Simple Church. Again, I left a lot of details out of the struggles of my first marriage, the abuse, the nightmare of family court and the memory loss from the abuse. However, I believe there is a purpose for all of this. While I don’t know God’s plan for my life, I trust in Him. A little less than a year ago, I shared a memory about when I was confronted about my not-so-girly tattoos. If you’d like to read about it and see some of my tattoos, you can do so here. I had no idea how I was going to continue without my mother. In addition to losing my sister only a year before my mom suddenly passing, I was now the guardian to my five and six year old nieces. My husband was not on board with that necessity. Add my daughter into the mix who never had to “share” mommy and chaos was the norm. My life was a mess. So yes, I prayed for strength daily. Turns out I was only a guardian for about a year. However, that experience will always stay with me. I will always second-guess decisions I had to make. Life hasn’t been the same since, but that’s a story for another day. Not too long ago, I had the tattoo finished. I added an cracking hourglass, with red sand and blue roses. Blue was my mom’s favorite color. The banner read, “Gone Too Soon”. I’m waiting for some money to get another tattoo. That will represent my status as an Army mom. It will be a single rose that will be red, white and blue. It will have a ribbon down the stem, saying, “Army Mom”. Finally, there will be a pair of dog tags at the bottom of the stem and my son’s name will be on one of the tags. It will go on my left forearm. Under my sister’s memorial tattoo. My son and my sister had a special bond, so it’s only fitting their tattoos share the same arm. A couple tattoos I didn’t share in the last post are on my legs. My left leg bears my volunteer work when I was with Soldiers’ Angels. I wrote to many deployed military personnel and Gold Star families. I even had the opportunity to coordinate a Marine homecoming. It was the highlight of my volunteer work. This the circle of the branches represent the halo and the wings represent the wings of an angel. This was my version of a “Soldier’s Angel”. I have two tattoos on my chest. These represent my children. My first four are on a rose that has four hearts and their initials are in one heart for each one of them. It was my very first tattoo and really needs to be redone. On the other side is a tattoo my youngest picked out as “her” tattoo. I had to talk her out of quite a few tattoo selections. I explained I’m getting a tattoo just for her, but since it will be on my body for life, I agree to it first. We ended up with a multicolored butterfly. So there’s a bit more a glimpse into who I am. I love my tattoos and the meaning behind each one. I enjoy discussing tattoos with people. They are just so interesting and normally there’s a story attached to each one. If you have a tattoo you’d like to share, I’d love to see them! I have to say, this video, “A Solider’s Deck of Cards” is one of my favorite YouTube videos of all time. I have been sharing this video for the last few years. I remember when I first saw it. I was stunned at how the cards could be interpreted as a Bible, Almanac and more. It affected me deeply as a military mom. I had several soldiers I had adopted and I couldn’t help but think of them, as well as other military personnel, far from home. I would love to thank Justin Flom for creating this video. Sure I can read the story on any number of sites, but he brought this story to life. The ending gets me every time. After watching the video, will you be able to look at a standard deck of cards the same again? Just the title alone, Girly Tattoos, would typically bring images of flowers, butterflies, whimsical fairies, etc. to mind. In my case however, it was a conversation I had with a stranger that reaffirmed my love for the body art I proudly display. 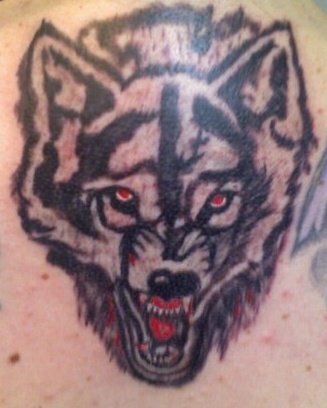 The snarling wolf head is the center tattoo on my shoulder line. There are additional tattoos to the left and right of the it; each about the same size. My shoulder line cannot be viewed unless I wear a tank top, which displays the three, good-size pieces. One night, while at a local bar with some friends, a mid-20s male got up from his group of buddies and made his way over to me, as I got up from my stool. For some reason, he felt some obligation to inform me that my tattoos were not “girly tattoos”. If you don’t have any tattoos, it’s hard to explain the offensiveness of his statement. I didn’t take it as a full-on attack, which it could have been, but I didn’t want to be nice, smile and just ignore the comment either. I chose a sarcastic response. Since his buddies were listening and watching on, seeing how this would play out, I wanted to make sure they could hear. That was sufficient. It earned the appropriate “OOOOOOOOOHs” from this buddies, as they brought closed fists to their mouths and laughed. Guys and size. Not sure what it is, but I knew a comparison would work in my favor. The guy who approached me really didn’t have much to say. I ended our interaction with, “I wasn’t aware I was supposed to get certain tattoos based on my gender. I suggest you don’t approach anyone else regarding their tattoo choices. It could end badly for you.” With that I walked away and he returned to his table; tale tucked between his legs in defeat. Had this guy been respectful when he approached me and not been trying to show off, he would have learned more about my not-so-girly tattoos. While my shoulder pieces hold special meaning for me, I didn’t get them for a fashion statement or to be a rebel. Most people are generally more than happy to talk about their ink and its meaning. Tattoos hold special meaning for a lot of people. I grew up with my dad getting tattoos at local fairs and carnivals. Yes, that was quite awhile ago. My mother HATED tattoos. She would take us kids on the rides and when we were done, my dad had a new tattoo. I never, ever, dreamed I have one, let alone 10 (and counting) tattoos on my body. While I don’t take pain well, tattoos have taken on an entirely new meaning for me. When my younger sister passed away from breast cancer, I knew I would be getting a memorial tattoo. In fact, I knew I would be getting it before she passed, as I was coming to grips with the terminal aspect of her disease. What shocked me, was my mother offered to pay for it. The picture I had chosen had come to represent my sister and my mother was completely on board. WOW! Times had changed. 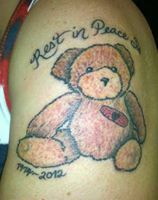 The “All Will Get Better Bear” memorial tattoo for my sister. The other tattoos I have represent significant times in my life. Sadly, and proudly, I have three memorial tattoos. My dad’s on my right calf, my mother’s on my right forearm and my sister’s above my left bicep. 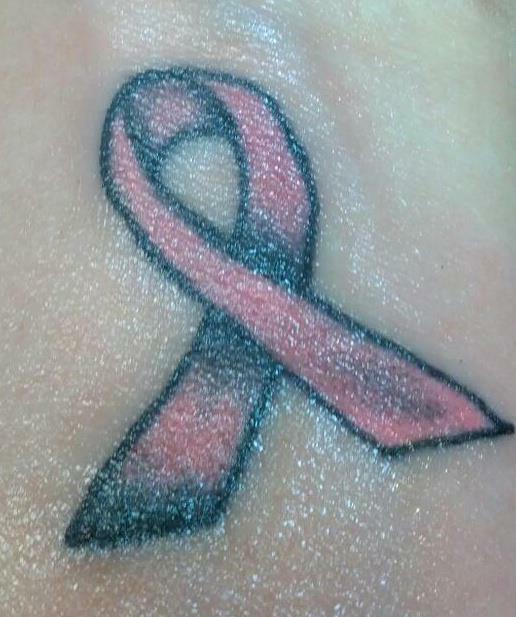 Additionally, I added a breast cancer ribbon to the inside of my left wrist. While some people don’t understand tattoos, I used my memorial tattoos in my stages of grieving. It helped me through. I was closer to my mother and sister, which is why their tattoos are on my arm. I can look at either arm, at any time, and see “them. The other tattoos represent significant times and/or meanings in my life. I know people who get tattoos just to have them. I know people who get them as the tattoos are attached to their culture and heritage or for religious reasons. I respect their decisions in how they adorn their bodies. I even respect those who choose not to display art via use their body as a canvas. All I ask in return is for the same respect.